Studio portrait of 2108 Acting Corporal (A/Cpl) Duncan Wallace Roy Whiteoak, 31st Battalion. 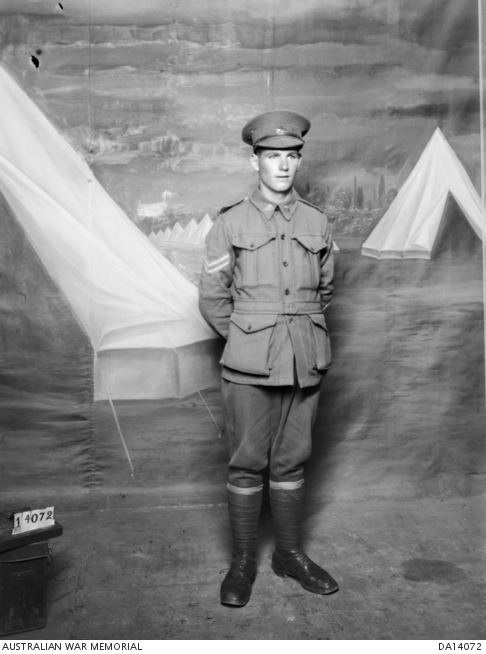 A labourer from Rozelle, NSW prior to enlistment, A/Cpl Whiteoak embarked with the rank of Private with the 3rd Reinforcements from Melbourne on HMAT Ballarat on 18 February 1916. Later transferring to the 47th Battalion, he was posted as missing in action. It was later determined that he had been captured and was being held as a prisoner of war. Following the Armistice he was repatriated to England and returned to Australia on 7 February 1920. This is one of a series of photographs taken by the Darge Photographic Company which had the concession to take photographs at the Broadmeadows and Seymour army camps during the First World War. In the 1930s, the Australian War Memorial purchased the original glass negatives from Algernon Darge, along with the photographers’ notebooks. The notebooks contain brief details, usually a surname or unit name, for each negative.